The Leo Diamond® Collection offers a wide variety of handcrafted diamond jewelry to celebrate life’s most memorable occasions, from engagements to anniversaries (and everything in between). This exquisite Leo Diamond Artisan ring has that far away sparkle she will adore. The ring features an independently-certified round diamond weighing 1 carat, beautifully set in 14K rose gold. Every Leo Diamond Artisan solitaire engagement ring is guaranteed to score three very high ratings on the GemEx Light Performance Report. The diamond is laser inscribed with a unique Gemscribe® number for your peace of mind. Diamond Total Carat Weight may range from .95 – 1.11 carats. This Leo Diamond Artisan ring shines with an independently certified round 1/2 carat diamond beautifully set in 14K white gold. Every Leo Diamond Artisan solitaire engagement ring is guaranteed to score three very high ratings on the GemEx Light Performance Report. This Leo Diamond Artisan ring dazzles with an independently certified 3/4 carat round diamond beautifully set in 14K white gold. Every Leo Diamond Artisan solitaire engagement ring is guaranteed to score three very high ratings on the GemEx Light Performance Report. This Leo Diamond Artisan ring thrills with an independently certified 1 carat round diamond beautifully set in 14K white gold. Every Leo Diamond Artisan solitaire engagement ring is guaranteed to score three very high ratings on the GemEx Light Performance Report. This Leo Diamond Artisan ring shimmers with an independently certified 1/3 carat round diamond beautifully set in 14K white gold. Every Leo Diamond Artisan solitaire engagement ring is guaranteed to score three very high ratings on the GemEx Light Performance Report. This magnificent Leo Diamond Artisan ring is a show-stopper. The ring features an independently certified 1½ carat round diamond beautifully set in 14K white gold. Every Leo Diamond Artisan solitaire engagement ring is guaranteed to score three very high ratings on the GemEx Light Performance Report. This Leo Diamond Artisan ring glimmers with an independently certified 5/8 carat round diamond beautifully set in 14K white gold. Every Leo Diamond Artisan solitaire engagement ring is guaranteed to score three very high ratings on the GemEx Light Performance Report. A brilliant 1/2 carat round Leo Diamond is set in a band crafted of 14K white gold in this compelling diamond solitaire ring for her. The diamond is independently certified and laser-inscribed with a unique Gemscribe® serial number. A captivating 1 carat round Leo Diamond is set in a band crafted of 14K white gold in this beautiful diamond solitaire ring for her. The diamond is independently certified and laser-inscribed with a unique Gemscribe® serial number. Handcrafted by the artisans at Leo Schachter, this sensational diamond solitaire ring features a 3/4 carat round diamond set in 14K white gold. The Leo Diamond® is independently certified and laser-inscribed with a unique Gemscribe® number. Featuring an independently certified 2 carat round diamond, this stellar Leo Diamond Artisan ring is beautifully set in 14K white gold. Every Leo Diamond Artisan solitaire engagement ring is guaranteed to score three very high ratings on the GemEx Light Performance Report. This elegant diamond solitaire ring features a shimmering round 1/2 carat Leo Diamond set in 14K yellow gold. The diamond is independently certified with a GemEx score of three Very High ratings on the Light Performance Report and is laser-inscribed with a unique Gemscribe® serial number. This stunning diamond solitaire ring features a round 1 carat Leo Diamond set in dazzling 14K yellow gold. The diamond is independently certified with a GemEx score of three Very High ratings on the Light Performance Report and is laser-inscribed with a unique Gemscribe® serial number. A brilliant 1/2 carat princess-cut Leo Diamond is set in a band crafted of 14K white gold in this compelling diamond solitaire ring for her. The diamond is independently certified and laser-inscribed with a unique Gemscribe® serial number. Handcrafted by the artisans at Leo Schachter, this sensational diamond solitaire ring features a 3/4 carat princess-cut Leo diamond set in 14K white gold. The Leo Diamond® is independently certified and laser-inscribed with a unique Gemscribe® number. A captivating 1 carat princess-cut Leo Diamond is set in a band crafted of 14K white gold in this beautiful diamond solitaire ring for her. The diamond is independently certified and laser-inscribed with a unique Gemscribe® serial number. This Leo Diamond Artisan ring shimmers with an independently certified 1/3 carat princess-cut diamond beautifully set in 14K white gold. Every Leo Diamond Artisan solitaire engagement ring is guaranteed to score three very high ratings on the GemEx Light Performance Report. This Leo Diamond Artisan ring shines with an independently certified 1/2 carat princess-cut diamond beautifully set in 14K white gold. Every Leo Diamond Artisan solitaire engagement ring is guaranteed to score three very high ratings on the GemEx Light Performance Report. This Leo Diamond Artisan ring dazzles with an independently certified 3/4 carat princess-cut diamond beautifully set in 14K white gold. Every Leo Diamond Artisan solitaire engagement ring is guaranteed to score three very high ratings on the GemEx Light Performance Report. This Leo Diamond Artisan ring thrills with an independently certified 1 carat princess-cut diamond beautifully set in 14K white gold. Every Leo Diamond Artisan solitaire engagement ring is guaranteed to score three very high ratings on the GemEx Light Performance Report. An extraordinary 2 carat princess-cut Leo Diamond is set in a band crafted of 14K white gold in this magnificent diamond solitaire ring for her. The diamond is independently certified with a GemEx score of three Very High ratings on the Light Performance Report and laser-inscribed with a unique Gemscribe® serial number. Celebrate the beauty of your love with light. Three brilliant princess-cut Leo Diamonds are the focal point of this three-stone engagement ring, crafted of 14K white gold. Shimmering round diamonds decorate the band, bringing the total diamond weight to 7/8 carat. The primary diamond is independently certified and is laser-inscribed with a unique Gemscribe® serial number for your peace of mind. Love. Light. Leo. Diamond Total Carat Weight may range from .80 – .94 carats. The embodiment of love and light, this three-stone engagement ring features a trio of brilliant Leo Diamonds at the center, complemented by shimmering round diamonds along the band. The ring has a total diamond weight of 7/8 carat and is crafted of lustrous 14K white gold. The primary stone is independently certified and is inscribed with a unique a Gemscribe® serial number for your peace of mind. Diamond Total Carat Weight may range from .80 – .94 carats. From The Leo Diamond®, this stunning and sentimental three-stone engagement ring features independently-certified round diamonds as its brilliant centerpiece. The polished 14K yellow gold band gleams with additional sparkling round diamonds, bringing the total weight of the ring to 1 carat. The center diamond is laser-inscribed with a unique Gemscribe® serial number for your peace of mind. Diamond Total Carat Weight may range from .95 – 1.11 carats. This three-stone Leo Diamond engagement ring features a trio of princess-cut diamonds, complemented by a chorus of round diamonds framing each and edging the band. The 14K white gold ring has a total diamond weight of 7/8 carat. The center diamond is laser-inscribed with a unique Gemscribe® serial number. Diamond Total Carat Weight may range from .80 – .94 carats. When love is as powerful as yours, it sparkles. When looking for a diamond that sparkles as brightly as your love, look no further than The Leo Diamond®. This Leo Diamond engagement ring displays an independently certified, princess-cut diamond at the center. Breathtaking round diamonds frame the center and decorate the bands. The ring is crafted of 14K white gold and has a total diamond weight of 3/4 carat. The center diamond is laser-inscribed with a unique Gemscribe® serial number for your peace of mind. Diamond Total Carat Weight may range from .69 – .79 carats. When love is as powerful as yours, it sparkles. When looking for a diamond that sparkles as brightly as your love, look no further than The Leo Diamond®. This Leo Diamond bridal set displays an independently certified, princess-cut diamond at the center. Breathtaking round diamonds frame the center and decorate the matching bands. The set is crafted of 14K white gold and has a total diamond weight of 7/8 carat. The center diamond is laser-inscribed with a unique Gemscribe® serial number for your peace of mind. Diamond Total Carat Weight may range from .80 – .94 carats. This exquisite 3-stone Leo Diamond engagement ring features a trio of princess-cut diamonds, beautifully complemented by rows of brilliant round diamonds. The ring has a total diamond weight of 1 1/4 carats and comes with a unique Gemscribe® number engraved on the diamond. The ring is fashioned in beautiful 14K white gold. Every Leo Diamond .05 carat and larger is independently and individually measured for superior fire, sparkle and brilliance. This certification, known as “return of light,” is your written proof. Diamond Total Carat Weight may range from 1.23 – 1.28 carats. This amazing engagement ring for her features a trio of breathtaking princess-cut Leo Diamonds. Round diamonds frame each of the center diamonds and decorate the band of 14K white gold. The visibly brighter Leo Diamond ring has a total diamond weight of 1 1/4 carats. Diamond Total Carat Weight may range from 1.23 – 1.28 carats. Two carats total weight of round diamonds in 18K white gold make up this fine ring. A trio of diamonds is set in platinum, with round diamonds accenting either side. The diamonds are certified, and a unique Gemscribe® serial number has been laser-inscribed on the center diamond. The inside of the band features a round diamond within the Leo signature. Three dazzling round Leo Diamonds form the center of this exciting engagement ring for her. The 14K white gold band shimmers with additional round Leo Diamonds. The ring has a total diamond weight of 3/4 carat. The center diamond is Independently Certified and laser-inscribed with a unique Gemscribe® serial number. The centerpiece of this engagement ring for her is a princess-cut Leo Diamond that has been certified and laser-inscribed with a unique Gemscribe® serial number. An additional princess-cut Leo Diamond accents each side of the engagement ring, with round Leo Diamonds flowing along the band of 14K white gold. The ring has a total diamond weight of 1½ carats. Three spellbinding round Leo Diamonds form the center of this amazing engagement ring for her. The 14K white gold band is showered in additional sparkling round Leo Diamonds. The ring has a total diamond weight of 1 carat. Independently Certified and laser-inscribed with a unique Gemscribe® serial number. The centerpiece of this fiery diamond ring for her is a stunning princess-cut Leo Diamond that has been independently certified and laser-inscribed with a unique Gemscribe® serial number. Additional princess-cut and round Leo Diamonds accent either side of the elegant engagement ring. The ring, styled in 14K white gold, has a total diamond weight of 7/8 carat. This gorgeous Leo Diamond engagement ring beautifully demonstrates how only one diamond can sparkle as brightly as your love. An independently certified, 1/2 carat princess-cut Leo Diamond is the stunning focal point, while shimmering round diamonds frame the center and flow gracefully along the band. The ring is styled in 14K white gold and has a total diamond weight of 1 carat. The center diamond is laser-inscribed with a unique Gemscribe® serial number for your peace of mind. Diamond Total Carat Weight may range from .95 – 1.11 carats. This exceptional Leo Diamond engagement ring features an independently certified princess-cut diamond framed in round diamonds. Princess-cut diamonds flow through the center of the 14K white gold band, complemented by round diamonds above and below. The ring has a total diamond weight of 2 1/8 carats, and the center diamond is laser-inscribed with a unique Gemscribe® serial number. Diamond Total Carat Weight may range from 2.115 – 2.14 carats. Petals decorated with round diamonds embrace the princess-cut diamond at the center of this remarkable Leo Diamond engagement ring. Round diamonds sparkle along the 14K white gold band, bringing the total diamond weight to 3/4 carat. The center diamond is independently certified and is laser-inscribed with a unique Gemscribe® serial number for your peace of mind. Diamond Total Carat Weight may range from .69 – .79 carats. There is only one diamond that shines as brightly as your love – and this is the one. This amazing Leo Diamond engagement ring showcases a stunning 1/2-carat, princess-cut diamond that shines brilliantly in a halo of round diamonds. Sparkling ribbons of round diamonds sweep toward the center to create the band, bringing the total diamond weight to 7/8 carat. The ring is beautifully styled in 14K white gold. The independently certified center diamond is laser-inscribed with a unique Gemscribe® serial number to ensure your peace of mind. Diamond Total Carat Weight may range from .80 – .94 carats. Always shining bright and true, The Leo Diamond® captures the essence of your love with light. This stunning engagement ring features an independently certified round diamond at the center, engraved with a unique Gemscribe® serial number for your peace of mind. A hexagon frame, decorated in round diamonds, gives the ring a modern edge. Crafted of 14K white gold, the ring has a total diamond weight of 5/8 carat. Diamond Total Carat Weight may range from .58 – .68 carats. Only one diamond can sparkle as brightly as your love. This stunning Leo Diamond engagement ring features a round diamond center, haloed in dazzling diamonds. More diamonds shimmer along the gently curved band, styled in 14K white gold. The ring has a total diamond weight of 7/8 carat. The independently certified center diamond is laser-inscribed with a unique Gemscribe® serial number. Diamond Total Carat Weight may range from .80 – .94 carats. Only one diamond can sparkle as brightly as your love. This stunning Leo Diamond bridal set features a round diamond center, haloed in dazzling diamonds. More diamonds shimmer along the gently contoured band, styled in 14K white gold, with a contoured wedding band to match. The bridal set has a total diamond weight of 1 1/8 carats. The independently certified center diamond is laser-inscribed with a unique Gemscribe® serial number. Diamond Total Carat Weight may range from 1.115 – 1.14 carats. A breathtaking round Leo Diamond sparkles at the center of this incredible engagement ring, crafted of 14K white gold. An array of round diamonds create an elegant frame around the center and line the band. The ring has a total diamond weight of 1 1/8 carats. The primary diamond is independently certified and is laser-inscribed with a unique Gemscribe® serial number. Diamond Total Carat Weight may range from 1.115 – 1.14 carats. Round diamonds frame the independently certified, princess-cut diamond center of this spellbinding engagement ring from The Leo Diamond®. Ribbons of 14K rose gold and round diamonds flow along the band, bringing the total diamond weight to 3/4 carat. The center diamond is laser-inscribed with a unique Gemscribe® serial number for your peace of mind. Diamond Total Carat Weight may range from .69 – .79 carats. Round diamonds frame the independently certified princess-cut diamond center of this spellbinding engagement ring from The Leo Diamond®. Ribbons of 14K white gold and round diamonds flow along the band, bringing the total diamond weight to 3/4 carat. The center diamond is laser-inscribed with a unique Gemscribe® serial number. Diamond Total Carat Weight may range from .69 – .79 carats. This stunning engagement ring features a modern design for modern love. A princess-cut Leo Diamond forms a peak between the curved 14K white gold band. Round diamonds shimmer along the band, bringing the total diamond weight to 5/8 carat. The center diamond is independently certified and is laser-inscribed with a unique Gemscribe® serial number for your peace of mind. Diamond Total Carat Weight may range from .58 – .68 carats. This stunning bridal set features a modern design for modern love. A princess-cut Leo Diamond forms a peak at the center of the curved 14K white gold band. Round diamonds shimmer along the engagement band and matching wedding ring, bringing the total diamond weight to 7/8 carat. The center diamond is independently certified and is laser-inscribed with a unique Gemscribe® serial number for your peace of mind. Diamond Total Carat Weight may range from .80 – .94 carats. There is only one diamond that shines as brightly as your love – and this is the one. This amazing Leo Diamond bridal set showcases a stunning 1/2-carat, princess-cut diamond that shines brilliantly in a halo of round diamonds. Sparkling ribbons of round diamonds create the bands of the engagement ring and matching wedding band, bringing the total diamond weight to 1 carat. The set is beautifully styled in 14K white gold. The independently certified center diamond is laser-inscribed with a unique Gemscribe® serial number to ensure your peace of mind. Diamond Total Carat Weight may range from .95 – 1.11 carats. An exquisite independently certified 1-carat emerald-cut diamond is the highlight of this marvelous Leo Diamond bridal set. Shimmering round diamonds enliven the 14K white gold bands of the engagement ring and matching wedding band, for a total diamond weight of 1 5/8 carats. The central diamond is independently certified with three very high ratings on the GemEx scale, and has a unique laser-inscribed Gemscribe® serial number to ensure your peace of mind. Diamond Total Carat Weight may range from 1.58 – 1.68 carats. An exquisite tribute to your love, this Leo Diamond bridal set features a radiant-cut diamond complemented with a host of shimmering round diamonds. Styled in beautiful 14K white gold, the engagement ring and matching wedding band total 1 3/4 carats of diamonds. The center diamond is independently certified and and laser-inscribed with a unique Gemscribe® serial number to ensure your peace of mind. Diamond Total Carat Weight may range from 1.69 – 1.79 carats. This incredible Leo Diamond bridal set for her is awash in brilliant round diamonds. Crafted of 14K rose gold, the set has a total diamond weight of 2 1/4 carats. The central diamond, certified to have at least two Very High ratings on the GemEx Light Performance Report, is laser-inscribed with a unique Gemscribe® serial number for your peace of mind. Diamond Total Carat Weight may range from 2.23 – 2.28 carats. This incredible Leo Diamond bridal set is awash in brilliant round diamonds. Crafted of 14K yellow gold, the set has a total diamond weight of 2 1/4 carats. The central diamond, certified to have at least two Very High ratings on the GemEx Light Performance Report, is laser-inscribed with a unique Gemscribe® serial number for your peace of mind. Diamond Total Carat Weight may range from 2.23 – 2.28 carats. This incredible Leo Diamond bridal set for her is awash in brilliant round diamonds. Crafted of 14K white gold, the set has a total diamond weight of 2 1/4 carats. The central diamond, certified with at least two Very High ratings on the GemEx Light Performance Report, is laser-inscribed with a unique Gemscribe® serial number for your peace of mind. Diamond Total Carat Weight may range from 2.23 – 2.28 carats. An astounding array of diamonds set in 14K white gold, this Leo Diamond bridal set truly sparkles as brightly as your love. An independently certified princess-cut diamond framed in round diamonds is the breathtaking focal point, while more round diamonds shine along the matching bands. The set has a total diamond weight of 1 3/8 carats. The center diamond is laser-inscribed with a unique Gemscribe® serial number for your peace of mind. Diamond Total Carat Weight may range from 1.37 – 1.44 carats. A breathtaking independently certified princess-cut diamond is the crowning touch of this entrancing 14K white gold bridal set from The Leo Diamond®. Sparkling round diamonds adorn the band of the engagement ring and matching wedding band, bringing the total diamond weight to 1 1/2 carats. The center diamond is laser-inscribed with a unique Gemscribe® serial number. Diamond Total Carat Weight may range from 1.45 – 1.57 carats. There’s nothing quite like the Leo, the diamond with far-away sparkle. The exquisite diamond engagement ring to this bridal set features a 5/8 carat center Leo Diamond with a Three Very High Rating on the Light Performance Report. The diamond is engraved with a unique Gemscribe serial number, visible under 10x magnification, for your peace of mind. Additional round diamonds encircle the center and line the ring, as well as the matching wedding band, bringing the total diamond weight of the bridal set to 1 1/2 carats. The finishing touch is “The Leo,” engraved on the inside of each band and accented with a single diamond. The bridal set is fashioned in beautiful 14K white gold. Diamond Total Carat Weight may range from 1.45 – 1.57 carats. A marvelous princess-cut Leo Diamond is the focal point of the engagement ring in this thrilling bridal set for her. Shimmering round diamonds frame the center and flow along the 14K white gold band of the engagement ring and matching wedding band, bringing the total diamond weight to 1 1/4 carats. The center diamond is independently certified and features a unique laser-inscribed Gemscribe® serial number to ensure your peace of mind. Diamond Total Carat Weight may range from 1.23 – 1.28 carats. A radiant symbol of your love and commitment, this bridal set from The Leo Diamond® showcases an independently certified, princess-cut diamond center. Sparkling lines of round diamonds brilliantly frame the center and intermingle along the band of the engagement ring. The contoured wedding band glistens with more round diamonds, bringing the total diamond weight to 1 1/4 carats. The bridal set is styled in romantic 14K rose gold. The center diamond is laser-inscribed with a unique Gemscribe® serial number for your peace of mind. Diamond Total Carat Weight may range from 1.23 – 1.28 carats. This breathtaking Leo Diamond bridal set is a stunning display of the diamond with Far Away Sparkle™. The independently certified, 5/8-carat round diamond at the center of the engagement ring is enhanced by a shimmering frame and romantic twists along the band decorated in diamonds. The sparkling wedding band completes the set and brings the total diamond weight to 1 3/8 carats. The bridal set is crafted of 14K white gold. Diamond Total Carat Weight may range from 1.37 – 1.44 carats. A scintillating princess-cut Leo Diamond is the focal point of this elegant engagement ring for her. Shimmering round diamonds frame the center and flow along the 14K white gold band and the matching wedding band, bringing the total diamond weight of the bridal set to 1 1/2 carats. The center diamond is independently certified and features a unique laser-inscribed Gemscribe® serial number to ensure your peace of mind. Diamond Total Carat Weight may range from 1.45 – 1.57 carats. A visibly brighter 1/2 carat Leo Diamond is the center of attention in this exquisite engagement ring for her. Additional round Leo Diamonds encircle the center and decorate the band of 14K white and yellow gold. Round diamonds line the matching 14K yellow gold wedding band to complete the set, bringing the total diamond weight to 1 1/5 carats. Diamond Total Carat Weight may range from 1.18 – 1.22 carats. In this Leo Diamond bridal set, a 1/2 carat brilliant round diamond is encircled by more round-cut diamonds. To complete the look, rows of round diamonds line the band and the matching wedding band, both set in 14K rose gold, bringing the total diamond weight of the bridal set to 1 1/4 carats. Every Leo Diamond .05 carat and larger is independently and individually measured for superior fire, sparkle and brilliance. This certification, known as “return of light,” is your written proof. In addition, the center diamond is engraved with a unique Gemscribe® number. Diamond Total Carat Weight may range from 1.23 – 1.28 carats. A breathtaking 1/2 carat princess-cut Leo Artisan Diamond is at the center of this exquisite diamond engagement ring for her. Rated 3x very high on the Light Performance Report, this diamond is sure to get plenty of attention. The diamond has a unique Gemscribe® number on it for your peace of mind. Surrounding the center are two frames of brilliant round diamonds, while additional channel-set round diamonds line the band of 14K white gold. The matching wedding band is lined with more channel-set round diamonds, bringing the total diamond weight of the bridal set to 1 1/2 carats. Diamond Total Carat Weight may range from 1.45 – 1.57 carats. A visibly brighter 3/8 carat Leo Diamond is the center of attention in this exquisite engagement ring for her. Additional round Leo Diamonds swirl around the center and decorate the band of 14K white gold. The matching wedding band features even more round diamonds, bringing the total weight of the bridal set to an impressive 1 1/5 carats. Diamond Total Carat Weight may range from 1.18 – 1.22 carats. This Leo Diamond bridal set is a shining expression of your love. An awe-inspirng emerald-cut Leo Diamond is the highlight of the stunning engagement ring. Round diamonds sparkle along the 14K white gold band of the engagement ring and matching wedding band. The set has a total diamond weight of 1 1/5 carats. The center diamond is independently certified and laser-inscribed with a unique Gemscribe® serial number. Diamond Total Carat Weight may range from 1.18 – 1.22 carats. A stunning 1/2 carat princess-cut Leo Artisan Diamond is at the center of this exquisite diamond engagement ring for her. Rated 3x very high on the Light Performance Report, this diamond is sure to draw attention. The diamond has a unique Gemscribe® number on it for your peace of mind. Brilliant round diamonds encircle the center, with additional round diamonds accenting either side and decorating the band of 14K white gold. The wedding band features additional round diamonds, bringing the total weight of the bridal set to 1 1/3 carats. Diamond Total Carat Weight may range from 1.29 – 1.36 carats. This Leo Diamond bridal set is a shining expression of your love. An awe-inspiring emerald-cut Leo Diamond is the highlight of the stunning engagement ring. Round diamonds sparkle along the 14K rose gold band of the engagement ring and matching wedding band. The bridal set has a total diamond weight of 1 1/5 carats. The center diamond is independently certified and laser-inscribed with a unique Gemscribe® serial number. Diamond Total Carat Weight may range from 1.18 – 1.22 carats. A marvelous princess-cut Leo Diamond is the focal point of this thrilling engagement ring. Shimmering round diamonds frame the center and flow along the 14K rose gold band. Additional diamonds line the matching wedding band, bringing the total diamond weight of the bridal set to 1 carat. The center diamond is independently certified and features a unique laser-inscribed Gemscribe® serial number to ensure your peace of mind. Diamond Total Carat Weight may range from .95 – 1.11 carats. A princess-cut Leo Diamond shines as bright as your love at the center of this ravishing engagement ring. Round Leo Diamonds frame the center and are channel-set into the 14K white gold band, bringing the total diamond weight to 3/4 carat. The Leo Diamond® is independently certified and laser-inscribed with a unique Gemscribe® serial number. A round Leo Diamond at the center of the engagement ring is embraced in more Leo Diamonds. Additional round Leo Diamonds flow along the band of the engagement ring and the matching band. The center diamond is certified and laser-inscribed with a Gemscribe® serial number. The set is in 14K white gold and a total weight of 1⅓ carats. A round Leo Diamond at the center of the engagement ring is framed in more Leo Diamonds. Additional round Leo Diamonds flow along the band of the engagement ring and the matching band. The center diamond is certified and laser-inscribed with a unique Gemscribe® serial number. The set is in 14K white gold and a total weight of 1 carat. Curves of breathtaking round diamonds flow around the magnificent round Leo Diamond center of this engagement ring for her. The central diamond is independently certified and laser-inscribed with a unique Gemscribe® serial number. The ring is crafted of lustrous 14K white gold and has a total diamond weight of 1⅜ carats. A princess-cut Leo Diamond at the center of the engagement ring is framed in round Leo Diamonds, 14K white gold and round Leo Diamonds flow along the band. The matching contoured wedding band is in 14K white gold. The center diamond is certified and laser-inscribed with a unique Gemscribe® serial number. The set has a total weight of 7/8 carat. Framed in round diamonds, a marquise Leo Diamond delivers exceptional brilliance to this breathtaking ring for her. Additional round Leo diamonds in two rows line the 14K white gold band to complete the look. The center diamond is independently certified and laser-inscribed with a unique Gemscribe® serial number. This lovely diamond ring has a total diamond weight of 1 carat. Lassos of extraordinary round diamonds flow around the magnificent round Leo Diamond center of this breathtaking engagement ring for her. The central diamond is independently certified and laser-inscribed with a unique Gemscribe® serial number. The ring is crafted of lustrous 14K white gold and has a total diamond weight of 1 carat. A 1/2 carat princess-cut center diamond is encircled by a host of round diamonds in this exquisite diamond engagement ring. Additional round diamonds line the 14K white gold band, bringing the total diamond weight to 7/8 carat. 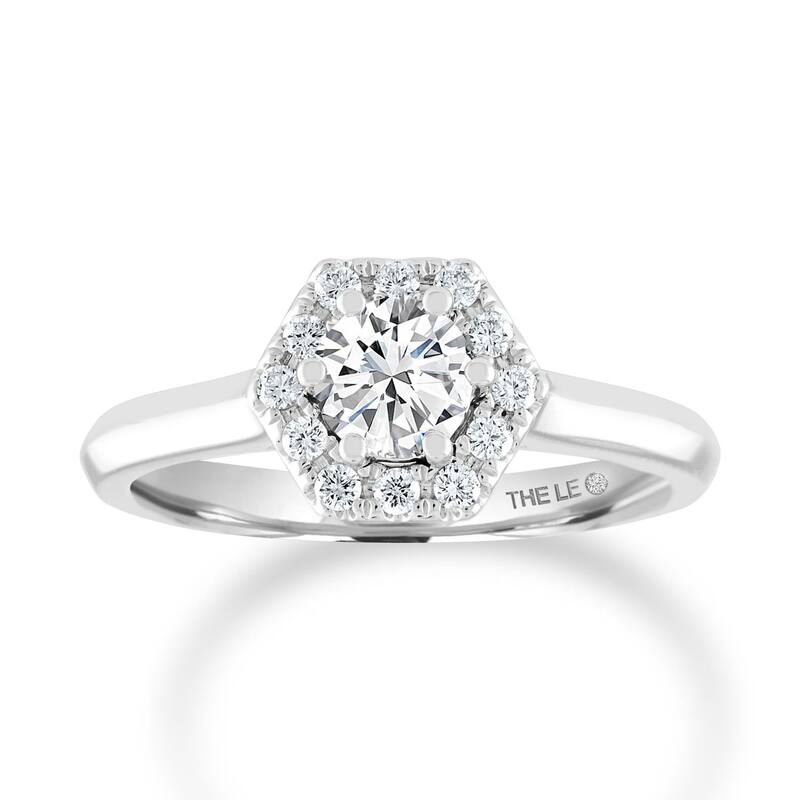 The ring is from The Leo Diamond® collection. A trio of striking Leo Diamonds framed in 14K rose gold is a beautiful symbol of your love in this engagement ring for her. More round Leo Diamonds shimmer along the band for a total diamond weight of 1⅓ carats. The ring is styled in 14K white gold. The Leo Diamond® is independently certified and laser-inscribed with a unique Gemscribe® serial number. A fabulous princess-cut Leo Diamond is the highlight of this magnificent engagement ring for her. Two rows of dazzling round diamonds frame the center and flow along the 14K white gold band. The central diamond is independently certified and laser-inscribed with a unique Gemscribe® serial number. The ring has a total diamond weight of 1¼ carats. A marvelous princess-cut Leo Diamond is the focal point of this thrilling engagement ring for her. Shimmering round diamonds frame the center and flow along the 14K white gold band, bringing the total diamond weight to 1 carat. The center diamond is independently certified and features a unique laser-inscribed Gemscribe® serial number to ensure your peace of mind. This beautiful wedding band for her features The Leo Diamond®, independently and individually certified to be visibly brighter. Sparkling diamonds totaling 1/4 carat in weight flow across the 14K white gold band, which is contoured to fit around her engagement ring. This classically styled wedding band is studded with enchanting Leo Diamonds. Totaling 1/4 carat in diamond weight, the ring is crafted in gleaming 14K white gold. The Leo Diamond® is independently certified and laser-inscribed with a unique Gemscribe® serial number. This Leo Diamond wedding band features 1/5 carat total weight of round diamonds set in 14K white gold. The band is contoured to beautifully complement her Leo Diamond engagement ring (sold separately). Sparkling with 1/5 carat in Leo Diamonds, this wedding band for her has a scalloped edge to fit around the matching engagement ring. The ring is styled in 14K white gold. The Leo Diamond® is independently certified and laser-inscribed with a unique Gemscribe® serial number. A line of stunning Leo Diamonds makes the classic wedding band for her truly extraordinary. The 14K white gold band has a total diamond weight of 1/5 carat. Stunning round Leo Diamonds line this breathtaking wedding band for her, styled in 14K white gold. The ring is contoured to fit alongside her matching engagement ring (sold separately) and has a total diamond weight of 1/4 carat. Dazzling round Leo Diamonds, totaling 1/4 carat in weight, are set in 14K white gold in this wonderful wedding band for her. The ring is contoured to fit alongside her matching engagement ring (sold separately). A pair of round Leo Diamonds cradle the center of this graceful engagement ring setting. Additional Leo Diamonds trace the band and the contoured wedding band. Styled in 14K white gold, the bridal setting has a total diamond weight of 5/8 carat, and the diamonds are independently certified by Gemological Science International. The center diamond is sold separately. Duos of round Leo Diamonds nestle either side of the center and line the generous 14K white gold band of this fabulous engagement ring setting. Additional channel-set Leo Diamonds line the matching wedding band. Independently certified by Gemological Science International, the diamonds total 1⅜ carats in weight. The center diamond is sold separately. Round Leo Diamonds trace the center and line the band of this pretty engagement ring setting. Additional Leo Diamonds, grace the matching wedding band. Fashioned in 14K white gold, the bridal setting has a total diamond weight of 1 carat, and the diamonds are independently certified by Gemological Science International. The center diamond is sold separately. With brilliant sweeps of round diamonds, this enhancer ring makes a spectacular addition to her Leo Diamond solitaire (sold separately). Fashioned in elegant 14K white gold, the ring has a total diamond weight of 5/8 carat. The primary diamonds are independently certified. Diamond Total Carat Weight may range from .58 – .68 carats. Curves decorated in round Leo Diamonds shine above and below a space for her diamond solitaire engagement ring (sold separately). This fabulous enhancer ring is styled in 14K white gold and has a total diamond weight of 1 carat. Diamond Total Carat Weight may range from .95 – 1.11 carats. This enchanting enhancer ring for her shines with radiant round Leo Diamonds above and below a space for her solitaire engagement ring (sold separately). Crafted of 14K white gold, the ring has a total diamond weight of 5/8 carat. Diamond Total Carat Weight may range from .58 – .68 carats. Brilliant round diamonds and polished sweeps of 14K yellow gold arch above and below the space for her Leo Diamond solitaire (sold separately) in this stunning enhancer ring. The independently certified diamonds total 5/8 carat in weight. Diamond Total Carat Weight may range from .58 – .68 carats. Brilliant round diamonds and lines of 14K rose gold gracefully cross above and below the center of this marvelous enhancer ring for her from The Leo Diamond®. Designed to wrap around her Leo Diamond solitaire (sold separately), the ring has a total diamond weight of 5/8 carat and is styled in polished 14K white gold. Diamond Total Carat Weight may range from .58 – .68 carats. Round diamonds shine brilliantly above and below the space for her Leo Diamond solitaire (sold separately) in this unforgettable enhancer ring for her. The independently certified diamonds total 1 carat in weight, and the ring is styled in polished 14K rose gold. Diamond Total Carat Weight may range from .95 – 1.11 carats. Dazzling princess-cut diamonds and a twist of 14K white gold adorn the top and bottom of this amazing enhancer ring for her from The Leo Diamond®. Designed to wrap around her Leo Diamond solitaire (sold separately), the ring has a total diamond weight of 1 5/8 carats. Diamond Total Carat Weight may range from 1.58 – 1.68 carats. Two dazzling rows of round diamonds crest above and below the space for her Leo Diamond solitaire in this lustrous enhancer ring. With a total diamond weight of 1 carat, the ring is styled in polished 14K white gold. Diamond Total Carat Weight may range from .95 – 1.11 carats. This breathtaking Leo Diamond enhancer ring features a peak of round independently certified diamonds cresting above and below a space to insert her solitaire engagement ring (sold separately). Curves of 14K white gold along the band complete the look. The ring has a total diamond weight of 3/4 carat. Diamond Total Carat Weight may range from .69 – .79 carats. Embrace your diamond solitaire engagement ring in brilliance with this 14K white gold Leo Diamond enhancer ring. A row of diamonds comes to a point on each side for a total diamond weight of 1 carat. Each Leo Diamond is certified and the unique laser-inscribed Gemscribe® serial number ensures your peace of mind. The diamond solitaire ring is sold separately. Nine Leo Diamonds will add stunning sparkle to your diamond solitaire with this 1/2 carat total weight diamond enhancer ring. Fashioned in 14K white gold, the ring is independently certified and laser-inscribed with a unique Gemscribe® serial number. The diamond solitaire is sold separately. Add brilliance to your princess-cut diamond solitaire with this stunning 14K white gold Leo Diamond enhancer. A princess-cut and a round diamond sparkle on either side. The enhancer ring has a total diamond weight of 1/2 carat and is independently certified and laser-inscribed with a unique Gemscribe® serial number. The diamond solitaire is sold separately. This magnificent anniversary band from The Leo Diamond® shines brightly with three rows of brilliant round diamonds. The ring is crafted of 14K white gold and has a total diamond weight of 1 1/2 carats. Diamond Total Carat Weight may range from 1.45 – 1.57 carats. This Leo Diamond anniversary band is a truly amazing symbol of love that is sure to get noticed. Round diamonds shine brilliantly in gently curved rows of 14K white gold to create the elegant design. The ring has a total diamond weight of 1 1/2 carats, and the primary diamonds are independently certified. Diamond Total Carat Weight may range from 1.45 – 1.57 carats. This amazing Leo Diamond anniversary band features waves of sparkling round diamonds that swirl around impressive center diamonds. Independently certified, the ring has a total diamond weight of 2 carats and is crafted in beautiful 14K white gold. Diamond Total Carat Weight may range from 1.95 – 2.11 carats. This gorgeous wedding band from The Leo Diamond® brilliantly displays a row of round diamonds amid a ribbon of 14K white gold. Contoured to fit alongside her matching Leo Diamond engagement ring (sold separately), the band has a total diamond weight of 1/4 carat. Diamond Total Carat Weight may range from .23 – .28 carats. Independently certified round diamonds create brilliant waves in this stunning Leo Diamond anniversary band for her. With a total diamond weight of 5/8 carat, the ring is styled in romantic 14K rose gold. Diamond Total Carat Weight may range from .58 – .68 carats. Style and timeless brilliance combine in this captivating Leo Diamond anniversary band. The contoured band features three waves of dazzling, independently certified round diamonds totaling 1 1/8 carats in weight. The ring is fashioned in polished 14K white gold. Diamond Total Carat Weight may range from 1.115 – 1.14 carats. New love is wonderful, but a love that grows with time is truly something to be treasured. This impressive, visibly brighter Leo Diamond anniversary band is the perfect way to celebrate such love, with dazzling independently certified princess-cut diamonds and shimmering round diamonds set in romantic 14K rose gold. The ring has a total diamond weight of 1 5/8 carats. Diamond Total Carat Weight may range from 1.58 – 1.68 carats. The diamond with faraway sparkle makes a stunning appearance in this exceptional ring for her. Independently certified round diamonds shine along the center of the band, while more shimmering round diamonds grace the edges. Crafted of 14K white gold, the ring has a total diamond weight of 1 1/2 carats. Diamond Total Carat Weight may range from 1.45 – 1.57 carats. For the woman who shines brightest, this remarkable Leo Diamond anniversary band displays a dazzling center row of independently certified princess-cut diamonds. Each princess-cut diamond is framed by curves of 14K white gold and complemented by sparkling round diamonds in between. More independently certified round diamonds edge the band and add even more brilliance, bringing the total diamond weight to 2 carats. Diamond Total Carat Weight may range from 1.95 – 2.11 carats. This breathtaking Leo Diamond wedding band sparkles with round diamonds, totaling 1 carat in weight. The band is contoured to fit alongside her matching engagement ring, sold separately. The ring is crafted of 14K white gold. Diamond Total Carat Weight may range from .95 – 1.11 carats. This stunning anniversary band features a truly modern design for modern true love. A round Leo Diamond is tucked between curves of 14K white gold at the center of the contoured band. Round diamonds shimmer along the band, bringing the total diamond weight to 3/4 carat. The center diamond is independently certified and is laser-inscribed with a unique Gemscribe® serial number for your peace of mind. Diamond Total Carat Weight may range from .69 – .79 carats. This spellbinding band from The Leo Diamond® is known for its far-away sparkle. Styled in 14K white gold, the gorgeous ring sparkles brilliantly with independently-certified round diamonds totaling 3 carats in weight. Each diamond is inscribed with a unique Gemscribe® serial number for your peace of mind. Diamond Total Carat Weight may range from 2.95 – 3.11 carats. Celebrate your lifetime of love together with eight near-colorless round Leo Diamonds set in beautiful 14K white gold. This fine jewelry ring has a total diamond weight of 3/8 carat and features independently certified diamonds, and the unique laser-inscribed Gemscribe® serial number ensures your peace of mind. Celebrate your continuing love for one another with this 14K white gold diamond ring featuring eight near-colorless round Leo Diamonds. The total diamond weight is 3/4 carat. The diamonds are independently certified, and the unique laser-inscribed Gemscribe® serial number ensures your peace of mind. The inside of the band features a round diamond within the Leo signature. Ten round Leo diamonds are channel-set between sweeps of 14K white gold in this sensational ring for her. One carat total diamond weight. Independently Certified and laser-inscribed with a unique Gemscribe® serial number. The inside of the band features a round diamond within the Leo signature. This beautiful anniversary band is awash with 25 unforgettable Leo Diamonds. This fine jewelry ring has a total diamond weight of 2 carats and is crafted in 14K white gold. This lovely ring features independently certified diamonds, and the unique laser-inscribed Gemscribe® serial number ensures your peace of mind. She will be proud to wear this 14K white gold diamond anniversary band that features five near-colorless round Leo Diamonds with a total diamond weight of 1 carat. This ring features independently certified diamonds, and the unique laser-inscribed Gemscribe® serial number ensures your peace of mind. The inside of the band features a round diamond within the Leo signature. Dazzling princess-cut Leo Diamonds grace this timeless anniversary band for her. A total of one carat diamond weight is set in stunning 14K white gold. This fine jewelry ring features independently certified diamonds, and the unique laser-inscribed Gemscribe® serial number ensures your peace of mind. Set in 14K white gold, this diamond band features eight round Leo Diamonds, with a total diamond weight of 1½ carats. This fine jewelry ring features independently certified diamonds, and the unique laser-inscribed Gemscribe® serial number ensures your peace of mind. This anniversary band features five round Leo Diamonds beautifully set in 14K white gold. With a total diamond weight of 5/8 carat, this fine jewelry ring features independently certified diamonds, and the unique laser-inscribed Gemscribe® serial number ensures your peace of mind. The inside of the band features a round diamond within the Leo signature. A diamond ring is the perfect way to say forever. This breathtaking row of Leo Diamonds is set in a 14K white gold anniversary band. With a total diamond weight of 5/8 carat, this fine jewelry ring features independently certified diamonds, and the unique laser-inscribed Gemscribe® serial number ensures your peace of mind. Perfect for an anniversary or wedding band, this magnificent ring sparkles with round Leo Diamonds separated by curves of 14K white gold. The ring has a total diamond weight of 1/3 carat and is independently certified and laser-inscribed with a unique Gemscribe® serial number. This diamond anniversary band is the perfect way to celebrate and honor your journey together. The dazzling assortment of Leo Diamonds, with a total diamond weight of 1 carat, is channel-set in 14K white gold. This fine jewelry ring features independently certified diamonds, and the center diamond has been laser-inscribed with a unique Gemscribe® serial number. Duets of brilliant Leo Diamonds sparkle against elegant bars of 14K white gold in this dramatic ring for her. This fine jewelry ring has a total diamond weight of 2 carats and is independently certified. The center diamond is laser-inscribed with a unique Gemscribe® serial number. Duets of round Leo Diamonds traced in swirls of 14K white gold form this breathtaking anniversary band for her. The diamonds are independently certified by Gemological Science International and are rated Triple Very High for brilliance, fire and sparkle by GemEx. The ring has a total diamond weight of 1¼ carats. Five exceptional round diamonds are channel set into 14K yellow gold in this powerful Leo Diamond men’s wedding band. The ring has a total diamond weight of 1 carat and features independently certified diamonds with unique laser-inscribed Gemscribe® serial numbers to ensure your peace of mind. Diamond Total Carat Weight may range from .95 – 1.11 carats. This distinguished Leo Diamond men’s wedding band features a generous band of 14K yellow gold embellished with brilliant, independently certified round diamonds. The ring has a total diamond weight of 5/8 carat. Diamond Total Carat Weight may range from .58 – .68 carats. This contemporary Leo Diamond wedding band for him displays a 1/4-carat square-cut diamond set in a generous band of 14K yellow gold. The sparkling diamond is independently certified. Diamond Total Carat Weight may range from .23 – .28 carats. This powerful Leo Diamond wedding band for him displays brilliant square-cut diamonds set in a center row of 14K yellow gold. The 14K white gold band provides handsome contrast. The independently certified diamonds total 1/3 carat in weight. Diamond Total Carat Weight may range from .29 – .36 carats. Three visibly brighter, independently certified, square-cut Leo Diamonds create the brilliance in this channel-set wedding band for him. One of the diamonds is inscribed with a unique Gemscribe® serial number for your peace of mind. Crafted of 14K yellow gold, the ring has a total diamond weight of 1/4 carat and features “The Leo” signature, with round diamond, on the inside of the band. Diamond Total Carat Weight may range from .23 – .28 carats. A 1/6-carat square-cut diamond shines brightly in the center of this handsome Leo Diamond wedding band for him. The ring is crafted of 14K yellow gold, and the diamond is independently certified. Diamond Total Carat Weight may range from .145 – .17 carats. This handsome men’s band from The Leo Diamond® features three brilliant square diamonds as the dynamic centerpiece. Textured edges and a center stripe of 14K yellow gold add bold touches to the 14K white gold band. The independently certified diamonds total 1/3 carat in weight. Diamond Total Carat Weight may range from .29 – .36 carats. This striking men’s Leo Diamond wedding band is decorated with a brilliant row of independently certified square-cut diamonds. With a total diamond weight of 1 carat, the ring is fashioned in 14K white gold. Diamond Total Carat Weight may range from .95 – 1.11 carats. This distinguished men’s Leo Diamond wedding band displays a dazzling round diamond in the center of the 14K white gold band, while more sparkling diamonds edge the ring to complement. The independently certified diamonds total 5/8 carat in weight. Diamond Total Carat Weight may range from .58 – .68 carats. A wave of independently certified round diamonds lends brilliance to this exceptional Leo Diamond wedding band for him. Crafted of polished 14K white gold, the ring has a total diamond weight of 1/2 carat. Diamond Total Carat Weight may range from .45 – .57 carats. Independently certified square diamonds lend brilliance to this distinguished men’s band from The Leo Diamond®. Styled in 14K white gold, the band is further embellished by a rope design along edges. The diamonds total 3/4 carat in weight. Diamond Total Carat Weight may range from .69 – .79 carats. Brilliant channel-set round diamonds define the center of this debonair men’s band from The Leo Diamond®. Rope-like texture edges the top and bottom of the 14K white gold band to complete the striking look. The independently certified diamonds total 5/8 carat in weight. Diamond Total Carat Weight may range from .58 – .68 carats. A trio of independently certified round diamonds arranged in a diagonal line creates the center of this powerful men’s band from The Leo Diamond®. A groove wraps around the band, while a textured rope design edges the top and bottom. The band is styled in 14K white gold and has a total diamond weight of 1/3 carat. Diamond Total Carat Weight may range from .29 – .36 carats. Impressive Leo Diamonds flow across this unforgettable men’s wedding band, crafted in 14K white gold. The ring has a total diamond weight of 1/2 carat. Diamond Total Carat Weight may range from .45 – .57 carats. A row of round Leo Diamonds is set in 14K white gold in this outstanding men’s wedding band. Notch and channel detailing adds sculptural appeal to the ring, which totals 3/8 carat in diamonds. Diamond Total Carat Weight may range from .37 – .44 carats. Five round Leo Diamonds are channel set into 14K white gold in this striking men’s wedding band. The band has a total diamond weight of 1/2 carat. The fine jewelry band features independently certified diamonds with unique laser-inscribed Gemscribe® serial numbers to ensure your peace of mind. A line of round Leo Diamonds is diagonally set between ridges of 14K white gold in this handsome men’s wedding band. The band has a total diamond weight of 1/4 carat. The fine jewelry band features independently certified diamonds. Two rows of round Leo Diamonds set this men’s wedding band ablaze with style. The ring is crafted of 14K white gold and has a total diamond weight of 1 carat. Powerful round Leo Diamonds fall into a grid in this handsome men’s wedding band. Crafted of 14K white gold, the ring has a total diamond weight of 5/8 carat. Three round Leo Diamonds are angled across stripes of 14K white gold in this sleek men’s wedding band. The ring has a total diamond weight of 1/6 carat. Three square-cut Leo Diamonds enliven this sleek men’s wedding band, crafted of 14K white gold. The ring has a total diamond weight of 1/2 carat and is independently certified and laser-inscribed with a unique Gemscribe® serial number. Channel-set in a contemporary 14K white gold band, seven round Leo Diamonds shine superbly through the center row of this wedding band for him. The independently certified diamonds total 1/2 carat in weight, and are rated Triple High on the GemEx scale for return of light. Two superb round Leo Diamonds dazzle in these classic diamond solitaire earrings for her set in 14K white gold. The earrings have a total diamond weight of 1/2 carat and secure with screw backs. Each diamond is independently certified, and a unique laser-inscribed Gemscribe® serial number ensures your peace of mind. Two incredible round Leo Diamonds shine in these classic diamond solitaire earrings for her set in 14K white gold. The earrings have a total diamond weight of 3/4 carat and secure with screw backs. Each diamond is independently certified, and a unique laser-inscribed Gemscribe® serial number ensures your peace of mind. Two breathtaking round Leo Diamonds take center stage in these classic diamond solitaire earrings for her set in 14K white gold. The earrings have a total diamond weight of 1 carat and secure with screw backs. Each diamond is independently certified, and a unique laser-inscribed Gemscribe® serial number ensures your peace of mind. Two stunning round Leo Diamonds sparkle in these classic diamond solitaire earrings for her set in 14K white gold. The earrings have a total diamond weight of 1/3 carat and secure with screw backs. Each diamond is independently certified, and a unique laser-inscribed Gemscribe® serial number ensures your peace of mind. These princess-cut Leo Diamond® solitaire earrings are simply dazzling. With a total diamond weight of 1/2 carat, these fine jewelry earrings are set in 14K white gold and are secured with screw backs. These earrings feature independently certified diamonds and a unique laser-inscribed Gemscribe® serial number. These striking diamond solitaire earrings add sophistication to any look and feature independently certified diamonds and a unique laser-inscribed Gemscribe® serial number. The total diamond weight for this fine jewelry pair is 3/4 carat. Each earring features a beautifully matched, princess-cut Leo Diamond® set in 14K white gold with secure screw backs. These stunning princess-cut Leo Diamond® solitaire earrings feature a total diamond weight of 1 carat and feature independently certified diamonds and a unique laser-inscribed Gemscribe® serial number. These fine jewelry earrings are set in 14K white gold and are secured with screw backs. This incredible Leo Diamond necklace for her is a stunning gift of love. The necklace features a heart-shaped pendant enlivened with brilliant, independently certified round diamonds. Styled in 14K white gold, the necklace has a total diamond weight of 1 carat. The 19-inch rolo chain fastens with a trigger clasp. The primary diamond is laser-inscribed with a unique Gemscribe® serial number. Diamond Total Carat Weight may range from .95 – 1.11 carats. A brilliant bezel-set Leo Diamond is dangling from a dainty hoop in each of these wonderful earrings for her. Shining with the light of your love, each diamond is laser-inscribed with a unique Gemscribe® serial number for your peace of mind. The 14K white gold earrings have a total diamond weight of 1/2 carat and secure with hinged backs. Diamond Total Carat Weight may range from .45 – .57 carats. Two round diamonds shine brilliantly in these striking Leo Diamond solitaire earrings. For a modern take on the stunning, classic design, the diamonds are bezel-set in beautiful 14K rose gold. The earrings secure with friction backs and have a total diamond weight of 5/8 carat. The diamonds are independently certified with three very high ratings on the GemEx scale, and each has a unique laser-inscribed Gemscribe® serial number to ensure your peace of mind. Diamond Total Carat Weight may range from .58 – .68 carats. These incredible Leo Diamond earrings will take her breath away for years to come. Each triangular earring displays a brilliant round center diamond framed in more sparkling diamonds. Styled in 14K white gold, the earrings have a total diamond weight of 1 carat and secure with friction backs. The independently certified center diamonds are laser-inscribed with unique Gemscribe® serial numbers. Diamond Total Carat Weight may range from .95 – 1.11 carats. Independently certified diamonds capture attention in these amazing Leo Diamond earrings for her. Each earring features a modern design with a brilliant round diamond and sparkling chevron of smaller diamonds. Crafted of 14K white gold, the earrings have a total diamond weight of 7/8 carat and secure with friction backs. The primary diamonds are laser-inscribed with unique Gemscribe® serial numbers. Diamond Total Carat Weight may range from .80 – .94 carats. This breathtaking Leo Diamond necklace for her showcases an independently certified princess-cut diamond as the brilliant centerpiece. A chevron of 14K white gold and sparkling round diamonds completes the look. The 19-inch necklace has a total diamond weight of 5/8 carat, and the rolo chain fastens with a trigger clasp. The primary diamond is laser-inscribed with a unique Gemscribe® serial number. Diamond Total Carat Weight may range from .58 – .68 carats. This captivating Leo Diamond necklace for her is a gift she will adore forever. A brilliant round diamond is embraced by a curl of diamonds and 14K white gold to create the dazzling pendant. With a total diamond weight of 5/8 carat, the pendant suspends from a 19-inch rolo chain that fastens with a trigger clasp. The diamonds are independently certified, and the primary diamond is laser-inscribed with a unique Gemscribe® serial number. Diamond Total Carat Weight may range from .58 – .68 carats. This thrilling Leo Diamond necklace for her captures attention with a brilliant, independently certified round diamond enveloped in more sparkling diamonds. Styled in 14K white gold, the necklace has a total diamond weight of 7/8 carat. The rolo chain is 19 inches in length. The center diamond is laser-inscribed with a unique Gemscribe® serial number. Diamond Total Carat Weight may range from .80 – .94 carats. A stunningly romantic expression of love, this Leo Diamond necklace for her features an independently certified round diamond framed in more dazzling round diamonds. With a total diamond weight of 1/2 carat, the heart-shaped pendant suspends from a 19-inch rolo chain that secures with a trigger clasp. The necklace is beautifully styled in 14K white gold. The primary diamond is laser-inscribed with a unique Gemscribe® serial number. Diamond Total Carat Weight may range from .45 – .57 carats. These stunning Leo Diamond solitaire earrings for her combine the timeless brilliance of round diamonds with a modern bezel setting. The earrings are styled in polished 14K white gold and secure with friction backs. The diamonds, which total 5/8 carat in weight, are independently certified for superior fire, sparkle and brilliance. Diamond Total Carat Weight may range from .58 – .68 carats. A gift she will love forever, this captivating Leo Diamond necklace for her displays a brilliant 5/8-carat round diamond bezel-set in 14K yellow gold. The 19-inch rolo chain secures with a trigger clasp. The independently certified diamond is laser-inscribed with a unique Gemscribe® serial number. Diamond Total Carat Weight may range from .58 – .68 carats. Three independently certified round diamonds tell your love story with brilliance in this amazing Leo Diamond necklace for her. Beautifully fashioned in 14K white gold, the necklace has a total diamond weight of 1 carat. The 19-inch rolo chain secures with a trigger clasp. Each diamond is laser-inscribed with a unique Gemscribe® serial number to ensure your peace of mind. Diamond Total Carat Weight may range from .95 – 1.11 carats. A gift she will always cherish, this stunning Leo Diamond necklace for her displays a brilliant 5/8-carat round diamond bezel-set in 14K rose gold. The 19-inch rolo chain secures with a trigger clasp. The independently certified diamond is laser-inscribed with a unique Gemscribe® serial number. Diamond Total Carat Weight may range from .58 – .68 carats. These incredible Leo Diamond earrings for her are an unforgettable gift to celebrate an unforgettable love. Each earring features two brilliant round diamonds beautifully set in 14K white gold. The earrings have a total diamond weight of 1 carat and secure with friction backs. The independently certified diamonds are laser-inscribed with unique Gemscribe® serial numbers. Diamond Total Carat Weight may range from .95 – 1.11 carats. This compelling Leo Diamond necklace for her features a sparkling round diamond suspended from an elongated bail, shimmering with round diamonds. The pendant sways from a 19-inch rolo chain and has a total diamond weight of 1/2 carat. The primary diamond is independently certified and is laser-inscribed with a unique Gemscribe® serial number for your peace of mind. Diamond Total Carat Weight may range from .45 – .57 carats. Showcasing the Diamond with Far Away Sparkle™, these amazing Leo Diamond earrings shine just as brightly as she does. Each earring features a brilliant round diamond haloed in diamonds for even more sparkle. Fashioned in 14K yellow gold, the earrings have a total diamond weight of 7/8 carat and secure with friction backs. The center diamonds are independently certified and laser-inscribed with a unique Gemscribe® serial number. Diamond Total Carat Weight may range from .80 – .94 carats. Three brilliant round Leo Diamonds express your love through light in this stunning necklace for her. The 14K yellow gold pendant glides along a 19-inch rolo chain that secures with a trigger clasp. Each independently certified diamond is laser-inscribed with a unique Gemscribe® serial number for your peace of mind. The necklace has a total diamond weight of 1 carat. Diamond Total Carat Weight may range from .95 – 1.11 carats. A brilliant way to tell your love story, this Leo Diamond necklace for her displays three independently certified round diamonds set in 14K white gold. With a total diamond weight of 5/8 carat, the pendant sways from a 19-inch rolo chain. The diamonds are laser-inscribed with unique Gemscribe® serial numbers. Diamond Total Carat Weight may range from .58 – .68 carats. A line of independently certified diamonds gradating in size sparkle along each of these elegant Leo Diamond earrings for her. Crafted of 14K white gold, the earrings have a total diamond weight of 5/8 carat and secure with friction backs. Diamond Total Carat Weight may range from .58 – .68 carats. With graceful curves and brilliant round diamonds, this Leo Diamond necklace is a truly stunning gift. The pendant displays a shining, independently certified round diamond center accompanied by more dazzling diamonds. Styled in 14K white gold, the necklace has a total diamond weight of 3/8 carat. The 19-inch rolo chain fastens with a trigger clasp. The primary diamond is laser-inscribed with a unique Gemscribe® serial number. Diamond Total Carat Weight may range from .37 – .44 carats. With graceful curves and independently certified round diamonds, these Leo Diamond earrings are a truly stunning gift. The earrings are adorned with 1/2 carat of brilliant diamonds set in 14K white gold and secure with friction backs. The primary diamonds are laser-inscribed with unique Gemscribe® serial numbers. Diamond Total Carat Weight may range from .45 – .57 carats. This remarkable Leo Diamond pendant for her features a dazzling round center diamond framed in more sparkling round diamonds. Styled in polished 14K white gold, the pear-shaped necklace has a total diamond weight of 1/2 carat. The rolo chain, which adjusts from 17 to 19 inches, secures with a lobster clasp. The independently certified center diamond is laser-inscribed with a unique Gemscribe® serial number. Diamond Total Carat Weight may range from .45 – .57 carats. A brilliant 1/2-carat princess-cut Leo Diamond framed in sparkling round diamonds creates the marvelous pendant of this necklace for her. More diamonds line the bail to complement, bringing the total diamond weight to 3/4 carat. The necklace is styled in polished 14K white gold, and the cable chain, which adjusts from 17 to 19 inches, secures with a lobster clasp. The independently certified princess-cut diamond is laser-inscribed with a unique Gemscribe® serial number. Diamond Total Carat Weight may range from .69 – .79 carats. This enchanting heart necklace for her displays a 3/8-carat independently certified Leo Diamond as its brilliant centerpiece. Sparkling round diamonds curve along the edge of the pendant, bringing the total diamond weight to 1/2 carat. The necklace is fashioned in polished 14K white gold, and the adjustable 17- to 19-inch cable chain fastens with a lobster clasp. The primary diamond is laser-inscribed with a Gemscribe® serial number to ensure your peace of mind. Diamond Total Carat Weight may range from .45 – .57 carats. A brilliant 3/8-carat, princess-cut diamond is exquisitely framed in sparkling round diamonds in this stunning Leo Diamond necklace for her. With a total diamond weight of 1/2 carat, the pendant suspends from a cable chain that adjusts from 17 to 19 inches and fastens with a lobster clasp. The necklace is beautifully styled in 14K white gold. The independently certified princess-cut diamond is laser-inscribed with a unique Gemscribe® serial number to ensure your peace of mind. Diamond Total Carat Weight may range from .45 – .57 carats. Both dazzling and stylish, this Leo Diamond lariat necklace for her features a 14K white gold teardrop that suspends from three sparkling bezel-set round diamonds. With a total diamond weight of 1/4 carat, the necklace adjusts from 17 to 19 inches. The cable chain secures with a lobster clasp. The necklace is independently certified and laser-inscribed with a unique Gemscribe® serial number. Diamond Total Carat Weight may range from .23 – .28 carats. An independently certified bezel-set Leo Diamond is at the heart of this elegant lariat necklace for her. Crafted of beautiful 14K white gold, the necklace is adjustable from 17 to 19 inches and fastens with a lobster clasp. The 3/8-carat diamond is laser-inscribed with a unique Gemscribe® serial number for your peace of mind. Diamond Total Carat Weight may range from .37 – .44 carats. With a dazzling 5/8-carat Leo Diamond bezel-set in polished 14K white gold, this stunning necklace for her is a modern take on a classic design. The independently certified diamond connects to an adjustable 17- to 19-inch cable chain that fastens with a lobster clasp. Diamond Total Carat Weight may range from .58 – .68 carats. This extraordinary bar necklace for her is brought to life by stunning Leo Diamonds, each independently and individually measured for superior fire, sparkle and brilliance. The 14K white gold design is suspended from a cable chain that adjusts from 17 to 19 inches and secures with a trigger clasp. The necklace has a total diamond weight of 3/4 carat. Diamond Total Carat Weight may range from .69 – .82 carats. This resplendent necklace from The Leo Diamond® sparkles with round diamonds, totaling 1 carat in weight. Every Leo Diamond .05 carat and larger is independently and individually measured for superior fire, sparkle and brilliance. The 14K white gold design suspends from a cable chain that adjusts from 16.25 to 18.25 inches and secures with a trigger clasp. Diamond Total Carat Weight may range from .95 – 1.11 carats. A radiant 1/3-carat round diamond, independently and individually measured for superior fire, sparkle and brilliance, is the focal point of this stunning Leo Diamond necklace for her. Curves of 14K white gold cradle the diamond. The pendant sways from a cable chain that adjusts from 17 to 19 inches and fastens with a trigger clasp. Diamond Total Carat Weight may range from .29 – .36 carats. A mesmerizing 1/3-carat Leo Diamond is nestled inside petals of 14K yellow gold in this dazzling necklace for her. The diamond is independently and individually measured for superior fire, sparkle and brilliance. The pendant sways from a cable chain that adjusts from 17 to 19 inches and secures with a trigger clasp. Diamond Total Carat Weight may range from .29 – .36 carats. Lustrous twists of 14K yellow gold embraces a brilliant round 1/2-carat Leo Diamond in this elegant necklace for her. The diamond is independently and individually measured for superior fire, sparkle and brilliance. The pendant sways from a cable chain that adjusts from 17 to 19 inches and secures with a trigger clasp. Diamond Total Carat Weight may range from .45 – .57 carats. A spiral of shimmering round diamonds envelops the stunning 1/3-carat diamond at the center of this mesmerizing Leo Diamond necklace for her. The necklace has a total diamond weight of 1/2 carat. The 14K white gold pendant sways from a cable chain that adjusts from 17 to 19 inches and secures with a trigger clasp. Diamond Total Carat Weight may range from .45 – .57 carats. A 1/2-carat round Leo Diamond dazzles amidst elegant curves of 14K white gold in this captivating necklace for her. The diamond is independently and individually measured for superior fire, sparkle and brilliance. The pendant sways from a cable chain that adjusts from 17 to 19 inches and fastens with a trigger clasp. Diamond Total Carat Weight may range from .45 – .57 carats. This breathtaking Leo Diamond necklace features a round 1/2-carat diamond, independently and individually measured for superior fire, sparkle and brilliance. A chorus of round diamonds halo the center and adorn the bail for a total diamond weight of 5/8 carat. The pendant sways from a cable chain that adjusts from 17 to 19 inches and secures with a trigger clasp. Diamond Total Carat Weight may range from .58 – .68 carats. This Leo Diamond necklace for her features a trio of round diamonds, each independently and individually measured for superior fire, sparkle and brilliance. Additional diamonds adorn the bail, bringing the total diamond weight to 3/4 carat. The pendant sways from a cable chain that adjusts from 17 to 19 inches and secures with a trigger clasp. Diamond Total Carat Weight may range from .69 – .82 carats. Magnificent round diamonds — independently and individually measured for superior fire, sparkle and brilliance — adorn this circular necklace for her, styled in 14K white gold. From The Leo Diamond®, the pendant has a total diamond weight of 1 carat and sways from a cable chain that adjusts from 17 to 19 inches and fastens with a trigger clasp. Diamond Total Carat Weight may range from .95 – 1.11 carats. This enchanting heart necklace for her is ablaze with round diamonds, independently and individually measured for superior fire, sparkle and brilliance. From The Leo Diamond®, the necklace is styled in 14k white gold and has a total diamond weight of 1 carat. The pendant sways from a cable chain that adjusts from 17 to 19 inches and fastens with a trigger clasp. Diamond Total Carat Weight may range from .95 – 1.11 carats. Independently certified round diamonds create a dazzling far-away sparkle along these stunning climber earrings for her. The Leo Diamond® earrings are crafted of 14K white gold and have a total diamond weight of 1 1/5 carats. A slim bar slips through the piercing and snugly hugs the backside of the ear to hold the earrings in place. Diamond Total Carat Weight may range from 1.18 – 1.22 carats. These earrings for her provide stunning sparkle with independently certified princess-cut Leo Diamonds framed in round diamonds. Styled in polished 14K white gold, the earrings have a total diamond weight of 1 carat and secure with friction backs. Each princess-cut diamond is laser-inscribed with a unique Gemscribe® serial number. Diamond Total Carat Weight may range from .95 – 1.11 carats. A dazzling, independently certified Leo Diamond is nestled in polished curves of 14K white gold in each of these stunning earrings for her. The earrings have a total diamond weight of 1/2 carat and secure with friction backs. Each diamond is laser-inscribed with a unique Gemscribe® serial number for your peace of mind. Diamond Total Carat Weight may range from .45 – .57 carats. Brilliant and sophisticated, these Leo Diamond earrings for her display two 1/2-carat independently certified round diamonds as the dazzling focal points. Each earring features three sparkling rows of diamonds that curve around the ear for an elegantly modern look. Styled in polished 14K white gold, the earrings have a total diamond weight of 1 1/2 carats and secure with friction backs. Diamond Total Carat Weight may range from 1.45 – 1.57 carats. Each of these dazzling earring climbers for her from The Leo Diamond® features a princess-cut diamond and round diamonds that elegantly curve up the ear. Styled in 14K white gold, the earrings have a total diamond weight of 1 carat. A wire hugs the back of the ear to keep the earrings securely in place. The primary diamonds are independently certified and laser-inscribed with unique Gemscribe® serial numbers. Diamond Total Carat Weight may range from .95 – 1.11 carats. Brilliant Leo Diamonds gently curve up the ear in each of these stunning earring climbers for her. The earrings are styled in polished 14K white gold and have a total diamond weight of 3/4 carat. A wire hugs the back of the ear to keep the earrings securely in place. The primary diamonds are independently certified and laser-inscribed with a unique Gemscribe® serial number. Diamond Total Carat Weight may range from .69 – .79 carats. A brilliant Leo Diamond is tucked inside elegant curves of 14K yellow gold in each of these remarkable earrings for her. Each diamond is independently and individually measured for superior fire, sparkle and brilliance. The earrings have a total diamond weight of 1/2 carat and secure with friction backs. Diamond Total Carat Weight may range from .45 – .57 carats. These thrilling earrings from The Leo Diamond® each feature a breathtaking diamond, independently and individually measured for superior fire, sparkle and brilliance. Curves of 14K white gold elegantly envelop the diamonds, totaling 5/8 carat in weight. The earrings secure with hinged backs. Diamond Total Carat Weight may range from .58 – .68 carats. An independently certified Leo Diamond is surrounded by a sparkling halo of diamonds in each of these wondrous stud earrings for her. Styled in 14K white gold, the earrings have a total diamond weight of 7/8 carat and secure with friction backs. Diamond Total Carat Weight may range from .83 – .94 carats. Independently and individually measured for superior fire, sparkle and brilliance, the diamonds on these hoop earrings are a spectacular display of the quality craftsmanship from The Leo Diamond®. The 14K white gold earrings have a total diamond weight of 7/8 carat and secure with hinged backs. Diamond Total Carat Weight may range from .83 – .94 carats.